Weepy Wednesday | WAYO 104.3FM Rochester, NY | Way out, right here. 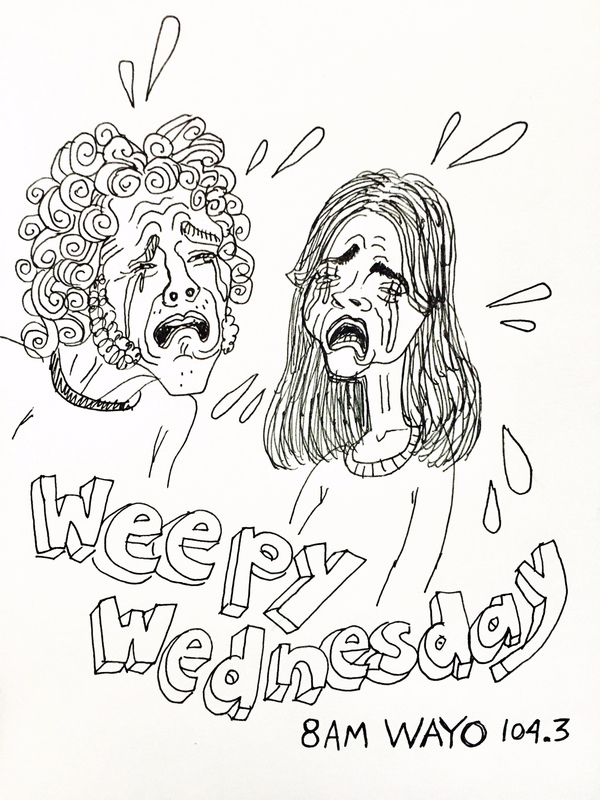 Weepy Wednesday is a morning music show with a running theme of crying. This includes songs about crying, songs that make you cry, songs that sound like crying, and songs with subject matter that inspires crying. The bulk of songs played are 50s, 60s, and 70s pop, rock, country and soul, with other eras and genres peppered in. Tune in on your way to work and cry out your mid-week frustration with us! It's good for you. Kicking things off with Alex's brother's High School a cappella group 8 Men Out covering "This Is The Last Time" by Keane, filled up with songs about goodbyes and last times, and wrapping up with Alison's sad instrumental transcription of "The End Has No End" by The Strokes on a very cheap keyboard. Goodbye, WAYO, we love you! Great soundtrack for when you're on the road and missing home!